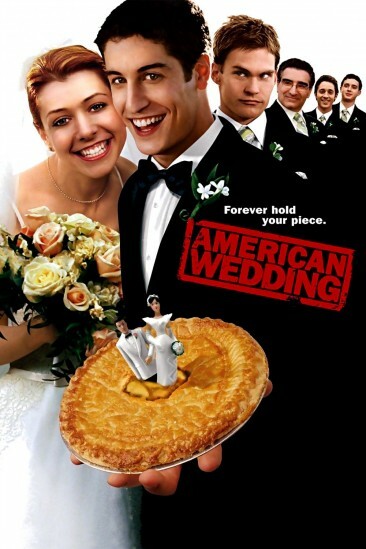 American Pie The Wedding has its thinly crusted comedy half baked. It's not so much a pie anymore, but more of a wedding cake. A three-tiered cake covered in raunchy icing, two plastic characters and a moist filling. The original and its sequel were more than enough, however this third instalment starts to experience staleness with its overtly sexual jokes. There are one or two laughs to be had, but not enough to save this wedding. Jim awkwardly proposes to Michelle (whilst she is "noshing" him off) to which he then meets her parents and tries to create the perfect wedding. However, it's an 'American Pie' film, and therefore perfection can only be achieved when talking about "boning" and Stifler wanting to bang every female possible (including grandmas). There's a wide array of differing jokes, such as inferred beastiality and amplified homosexual banter, in an attempt to keep the laughs fresh. However, aside from a long scene involving two strippers (I confess, I laughed), the comedy felt stale. They all involved raunchiness in some way and after seeing these types of jokes in the past two films, it was no longer humorous. It had lost the charm of its loveable characters. Jim and Michelle were sidelined at the own wedding for what is essentially 'American Pie: The Stifler Movie'. So much focus is on him, that actually it turns into a one man show instead of involving the original group more often. Sure, the characters and their relationships remain the same, but it never tries to be anything different. It is the same recycled humour for the third time, and unfortunately the lack of creativity shows. There are various moments that are enjoyable, and there are some that just go too far (Stifler consuming dog excrement, for example). The story moves along at a decent pace, and it never becomes boring. It's just tired. Fans of the previous two entries will enjoy this, as it's more of the same. However it irrefutably shows that the pie is starting to become mouldy.